Years after the end of the Human Genome Project (HGP), which mapped the human genetic blueprint, its contributions to science and scientific culture are still unfolding. Ioannis Pavlidis, Eckhard Pfeiffer Professor of Computational Physiology at the University of Houston, UH doctoral student Dinesh Majeti and Alexander Petersen, professor of management at the University of California, Merced, report in Science Advances that HGP scientists not only laid the groundwork for scientific breakthroughs for decades to come, but – because they worked together – brought to the mainstream a collaboration model that changed science’s cultural norms. 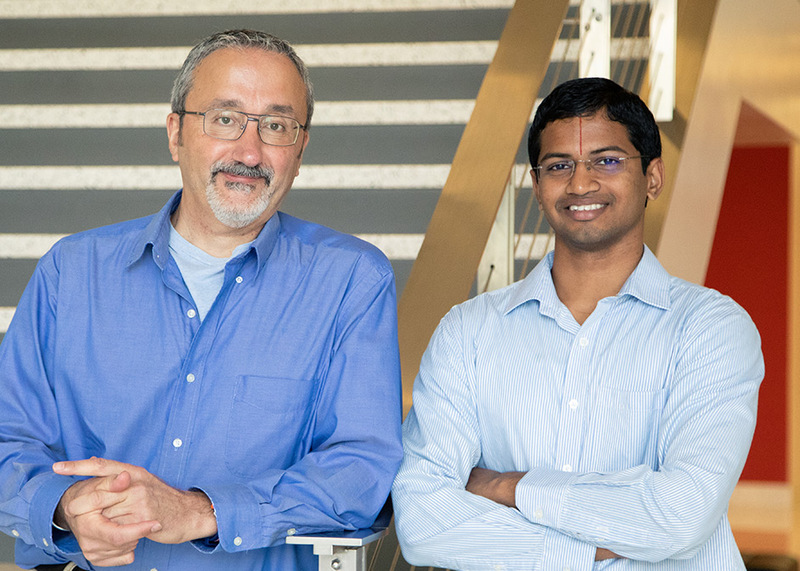 Ioannis Pavlidis, Eckhard Pfeiffer Professor of Computational Physiology at the University of Houston and UH doctoral student Dinesh Majeti. Since Galileo first peered into a telescope and DaVinci sketched out human anatomy, the business of science has been populated by independent endeavors. Systematic team efforts were transient exceptions. For centuries that image of the loner scientist was not updated, nor did it need to be – until now. Pavlidis and Petersen report that after the sequencing of the human genome was completed in 2003, the consortium model did not go away, and scientists never returned to their silos. It was a clear departure from norms. Researchers from biology, computing and other disciplines kept building consortia, unlocking the genetic secrets of fauna and flora, and in the process transforming the ability to understand, predict and edit life. “In an era where science has been professionalized, one cannot fully appreciate the reasons for genomics’ success unless you look at the effect it had on the researchers’ careers,” said Petersen. Evolution of the collaboration network in the biology-computing college in the United States from 1990 (pre Human Genome Project era) to 2015. Links represent co-authorship relationships. To investigate this, the authors assembled a dataset that included biographic and funding information for over 4,000 faculty in 155 biology and computing departments in the United States, including information for their 400,000+ publications co-authored with a network of nearly 500,000 collaborators. 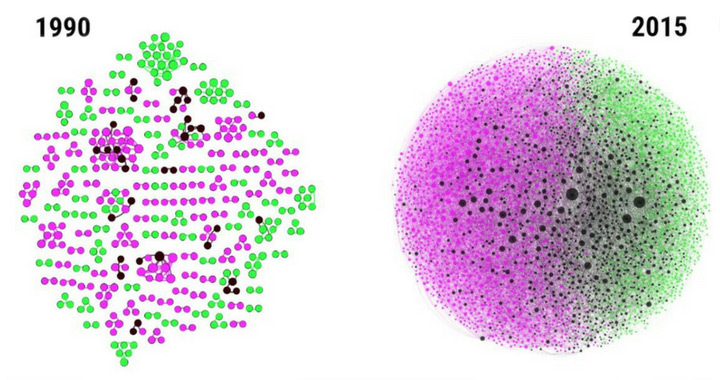 Using big data and counterfactual modeling, the team demonstrated that biology and computing researchers who crossed disciplinary boundaries collaborating with each other on genomics grounds had more successful careers than their mono-disciplinary colleagues. “Their cross-disciplinary publications had superior impact and the same patterns were found to be true at the international literature level,” said Petersen. Specifically, genomic articles with mixed authorship from biology and computing, or genomic articles with mixed biology and computing content, had significantly stronger impact compared to alternatives. Petersen and Pavlidis believe that as cross-disciplinary work continues, scientific advancements will follow suit. “If we continue to do this and have well-timed and well-designed funding efforts, as the Human Genome Project had, then I think we can put scientific progress on steroids,” said Pavlidis.